caption: honey, help your mother, on the boat now. caption: honey, help your mother on the boat now. caption: I saved my water bottle! 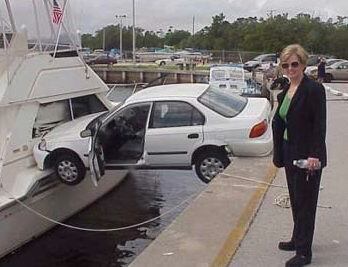 caption: The captain said to park next to the boat, doh! caption: I'm an excellent driver, really! caption: And amazingly....im still dry! caption: The obvious reason why houseboats dont have garages! caption: You told me to park as close to our boat as possible! caption: Honey? Where did Ted Kennedy park our car? caption: thought you said go for a dunk, not can you open the trunk! caption: Honey, the parking lot was full! caption: Is this close enough hun? caption: Another blonde mishap! Go figure! caption: Can I show you the latest thing since the house boat? caption: All I wanted to do is fill my water bottle! caption: Next time dear, use the gang plank...OK? caption: The best parking job by a women driver. caption: Damned valet parking, anyhow! caption: tell me again, which pedal is the brake! caption: Can you check my oil please? caption: Hey! You scratched my bumper! caption: Is this the ferry to Vancouver? caption: Foreign cars are so cheap, we make docks out of them!